Hi! I'm Layla! 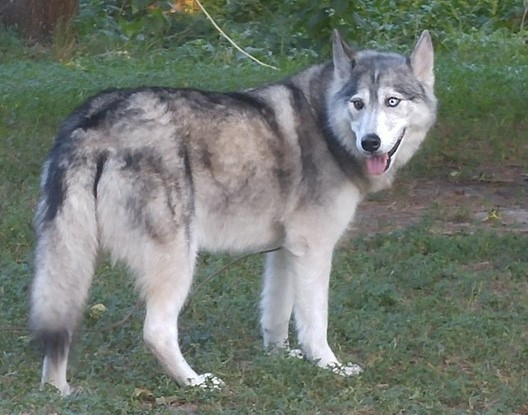 I'm a beautiful, calm and gentle Siberian Husky girl and I'm about to come to Colorado to find my forever home! Now for my deets: I'm 7 years old, 74 lbs., and am spayed. I'm heartworm positive but I'm on meds and soon I'll be all better! I'm up to date on my vaccinations. I'm great with people, kids, other dogs and kitties. I'm super loving and sweet. Best of all, check out my eyes --- one's blue and one's amber! I love leash walks, car rides and especially swimming! They say I'm a great swimmer --- so you can pretend you're at the Olympics every time you take me to a lake! I also enjoy hanging out quietly with people, and my activity level is moderate. Some great dog rescue heroes are already coordinating my trip to Colorado, so that's sure to happen! If you want more info about me, go to the top toolbar, click Adopt, click Dog Application, fill it out and send it in. One of the great volunteers from Summit Dog Rescue will get back to you as soon as they can.